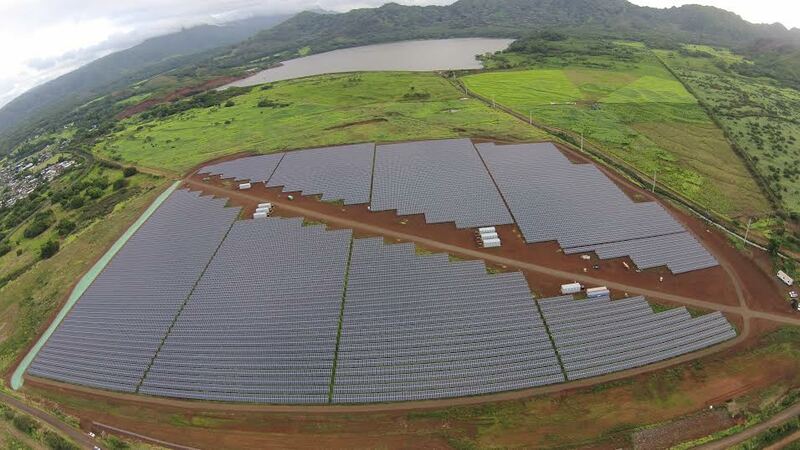 Kauaʻi Island Utility Cooperative (KIUC) has signed a power purchase agreement (PPA) with SolarCity (Nasdaq: SCTY) for electricity from the first utility-scale solar array and battery storage system designed to supply power to the grid in the evening, when demand is highest. The proposed SolarCity project next to KIUC’s Kapaia power plant is believed to be the first utility-scale system in the U.S. to provide dispatchable solar energy, meaning that the utility can count on electricity being available when it’s needed, even hours after the sun goes down. The 52 MWh battery system will feed up to 13 megawatts of electricity onto the grid to “shave” the amount of conventional power generation needed to meet the evening peak, which lasts from 5 p.m. to 10 p.m. By using the solar energy stored in the battery instead of diesel generators, KIUC will reduce its use of imported fossil fuels and also cut its greenhouse gas emissions. Under the terms of the 20-year contract, KIUC will pay SolarCity a lower rate than the current cost of conventional generation and only slightly more than the cost of energy from KIUC’s two existing 12 megawatt solar arrays, whose output is available only during the day. Pending state and county approvals, the array and battery storage facility will be built on 50 acres of land owned by Grove Farm Company, Inc. adjacent to KIUC’s Kapaia power station off Mā‘alo Road, just north of Līhu‘e. KIUC has requested an accelerated timetable for approval by the Hawai‘i Public Utilities Commission. To qualify for federal investment tax credits that will substantially reduce the cost of the project, construction work must begin by April 2016 so the project can be in commercial operation by December 31, 2016. SolarCity was the contractor on KIUC’s first 12-megawatt solar array in Kōloa, which went into commercial operation in September 2014 and supplies about 5 percent of Kaua‘i’s electricity.